"If you could steal things from dreams, what would you take? Ronan is one of the raven boys — a group of friends, practically brothers, searching for a dead king named Glendower, who they think is hidden somewhere in the hills by their elite private school, Aglionby Academy. The path to Glendower has long lived as an undercurrent beneath town. But now, like Ronan’s secrets, it is beginning to rise to the surface — changing everything in its wake." Back in October, I shared my review of the first book in 'The Raven Cycle' : The Raven Boys. I rated it a '4 cups of brew' read in the end. The characters being my favorite part of the book. 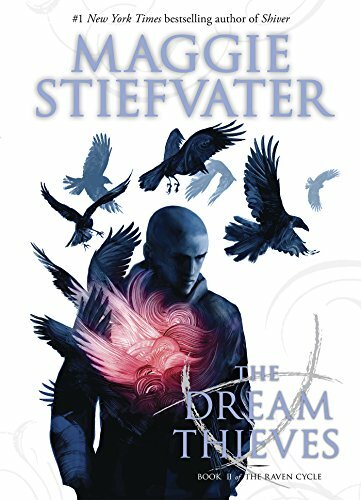 That being said, 'The Dream Thieves' took before mentioned characters up a notch. Oh- let me just tell you! And to make it even better- the plot was even more enjoyable than in 'The Raven Boys'. If you were slightly disappointed with the first book in this series, please- do not give up! Take a deep breath, regroup, & get ready for some 'hanging by the seat of your pants action'. Go ahead- what are you waiting on?